“How rewarding has writing been for you?” he asked. “Do you make money from blogging?” She wanted to know. These are the sort of questions I get fairly regularly. While the perception of what a typical career should look like is changing in this part of the world, there’s still a significant level of cynicism about certain vocations and how lucrative they are or aren’t. Writing falls in the category of such professions. Oftentimes, people wonder if the art can actually sustain anyone, especially those who are into it on a full time basis. The truth is that generally, writers are not well paid, at least in Nigeria. However, what I cannot deny is the amount of goodwill writing has brought me. I wasn’t quite short of it before I kick started my writing career, but I have enjoyed a tremendous amount of goodwill since I started this blog. Doors have been opened to me, and I have met people I would probably not have had the opportunity to meet if I didn’t explore this path. People who have never met me physically have been nice to me simply because I write. I don’t think I’ll trade that for monetary gains. In like manner, I believe that goodwill (and not necessarily humility) ensured that Efe Ejeba was crowned winner of the just concluded Big Brother Naija reality show. The young man won the game by a whopping 57.61% of the total votes. More than tripling the number of votes of his closest competitor, Bisola. It was a landslide victory. An election that would have been extremely difficult to rig if anyone even as much as conceived the idea. No doubt, Efe had a phenomenal fan base; the staggering stats he garnered each time he was up for eviction should have served as an indication that he really had no competition in the run-in to the finals. The unfettered love the former housemate received right from the beginning of the show left many scratching their heads. This was an unknown young man who only had a dream just like all the other thirteen contestants. Efe’s victory was all the more confounding, even as it became clearer and clearer towards the end of the show because he is from a humble background. He had no influential roots, neither did he have the level of popularity some of the other housemates (who were relatively well known in some quarters before the show) could leverage on. Someone said Nigerians love the typical grass to grace story, while this is true, I disagree that this sentiment is peculiar to Nigerians. Everyone loves the grass to the grace story. According to the National Bureau of Statistics, no fewer than 112 million Nigerians, representing 67.1% of the population live below the poverty line, and globally, there are about a billion people who are poor. This invariably means that majority of Nigerians can identify with Efe. They see themselves in him, and his journey into wealth and recognition serves as a ray of light at the end of the tunnel for them in their own struggles. Anyone who followed the show from inception will attest to the fact that Efe was not the most entertaining housemate. Housemates like Bisola and ThinTallTony were far more entertaining. And while the Warri-born graduate of Economics did well in a couple tasks and formed the right kind of allegiance in the house, he wasn’t the most charismatic of the lot. He also wasn’t the most articulate. Apart from the catchy slogans he created, and his penchant for speaking pidgin English, there was really nothing else that stood him out. Yes, he was intelligent, but, same could be said of some other housemates. Goodwill did it for Efe. For some reason he was just loved. He was loved in a special way. I have been an ardent viewer of the Big Brother reality show for a while, and I can safely say that no other housemate has enjoyed the kind of affection and support that was shown Efe since the Big Brother franchise kicked off in 2003. And you don’t have to take my word for it, the stats are there for everyone to see. And it wasn’t just about his Warri fans, and the extent they went to ensure their “son” was crowned winner. In every part of the country, Efe had die-hard fans. People who were ready to forfeit their meal just to see the budding rap artiste carry the day. There were quite a number of celebrities who supported TBoss, the controversial Nigerian-Romanian housemate, but they clearly didn’t have the passion and grit displayed by ordinary Nigerians and celebrities alike who put their money where their mouth is by not only making sure that Efe won the game, but that he did so in fine style. As an individual, if you must crave anything, it should be goodwill. The kind of affinity and favour that just makes people want to do stuff for you. You won’t have to beg for it. You won’t have to do much to earn their love. They can see your value, they appreciate your essence as a person. Your individuality, your journey, your fears, your flaws. You. The best thing about goodwill like a few other abstract attributes is that it cannot quantified. 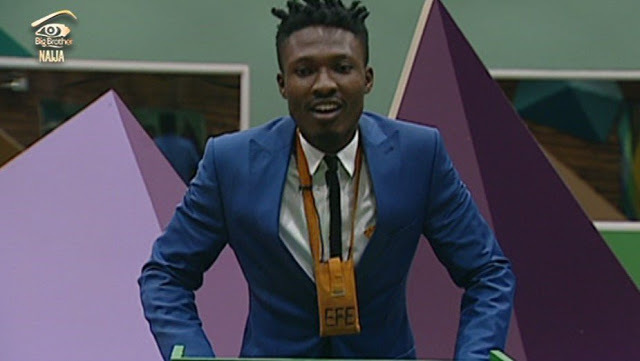 Beyond taking home the cash prize and SUV, Efe has found himself good friends in the millions of people that rallied round to see him succeed. What this means is that he has people from different walks of life who will be willing and ready to support any project he embarks upon. How do you quantify that in monetary terms? I have heard and read that humility did it for Efe, but I believe he just had a lot of goodwill. I am not quite sure humility alone suffices as an explanation for the crazy love and millions of adoring fans who staked a lot and never wavered in rooting for him. Goodwill is the real deal friends! Trust me, I do too. Thanks for contributing. Humility, goodwill and most of all,God’s grace crowns any effort we make. Personally,i think these gave Efe a landslide victory. Nigerians merely proved to her that she meant nothing. She unfortunately proved to everyone that she was beauty without Brains. I’m still wondering how she won payporte games prize and I think it was a way to stylishly compensate her cos Bassey was outstanding in all games before he was evicted. Can’t debate your submission, but that part about TBoss though…phew! Anwuli you’re not nice at all. I totally get you, but I believe Bisola also has a sob story. But like you stated, he was destined to win. Thanks Mayowa. Hmmmm… Goodwill… I can’t dispute this assertion. I had a good read. It wld be nice to know ‘HOW’ an individual can build Goodwill also. Maybe you can consider schooling us (ur ardent fans on this also). I think it basically comes from building a good reputation. People can easily recognize authenticity and integrity, and once they see that consistency in the character of an individual over time, goodwill is built gradually.Thanks for commenting Kev.